For most developers the Try, Catch, Finally construction is a very common way of handling errors. Within Microosft flow this is also possible. Today I setup a flow with a manual start and 3 Scopes. I renamed the scopes to Try, Catch and Finally. The only limitation to this solutions that I have found so far it that you can’t collect any exceptions that may be generated. 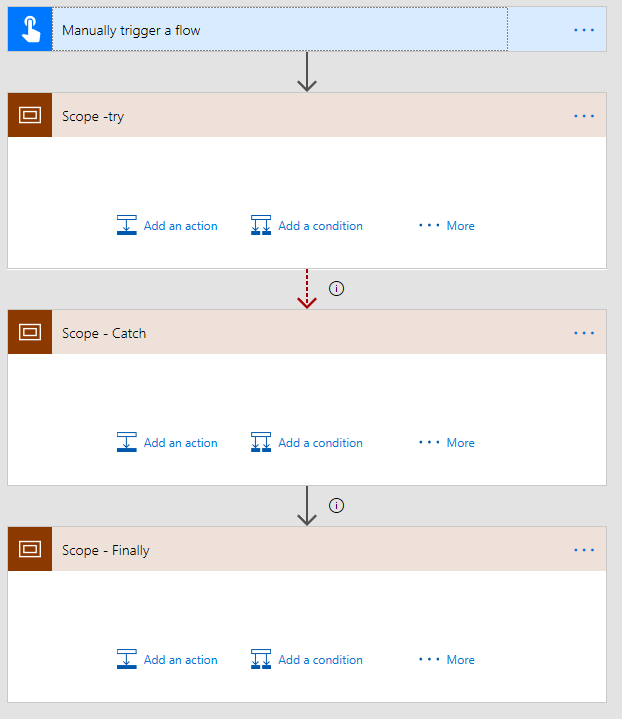 Hopefully soon Microsoft Flow will give the option to collect exceptions. Thank you, Peter! I was wondering about the best way to do try catch. I really like your approach because Scope clearly show what is inside Try, Catch and Finally. Without scopes – it was a total mess. It’s to bad the try scope will trigger the “Flow run failed.” message instead of showing success due to the catch scope. I find that it actually helps having the scope show “Flow run failed”, it means that it is quite easy to step into your flow so that you can find the failing action. I agree with you there. To clarify, my issue is when a “failure” is an acceptable completion of the flow there should be a way to not say it failed.